Pura Vida Patagonia offers seakayak trips Bariloche to connect with nature and know beautiful places of our Patagonia. 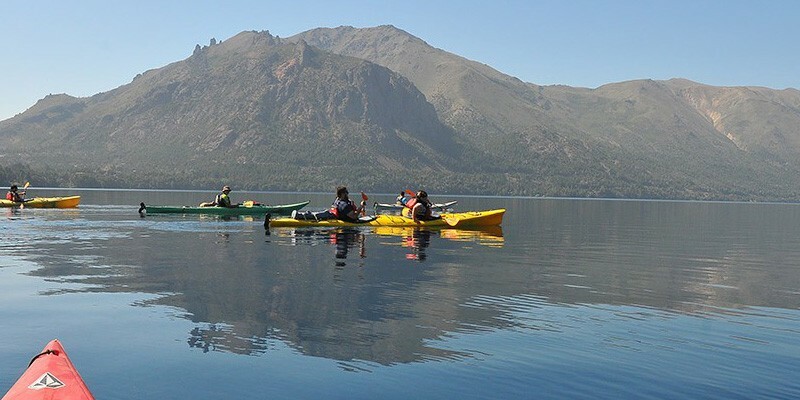 We offer a wide range of seakayak Bariloche where different overnith trips, luxury trips and family trips are combined. For more than 20 years we have aimed to provide the best experience in seakayak trips Bariloche. We have multiple options and different modalities for seakayak Bariloche itself. For our daily trips we offer the midday service starting with a guided trip at home by the Bay of Lake Gutierrez, recognized as one of the few places on Earth where the waters are totally pure to the point of being able to drink directly from the stream. After touring the extension of the Bay, it is proposed to take a break and enjoy a delicious tea with regional alfajores. The trip mentioned includes transportation to and from the hotel (optional), coffebreakt, support vehicle, bilingual kayak guides, insurance and water equipment. The equipment includes, kayak for two people, paddles, vests, mittens and jackets. Ask for advice on seakayak Bariloche at info@puravidapatagonia.com or complete the form.